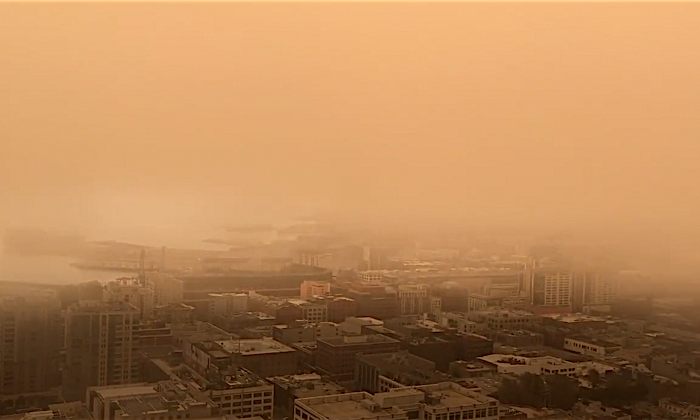 San Francisco and some surrounding areas have been covered in a thick yellow fog, due to the smoke and ash from nearby fires. The city was barely visible on Sunday, July 1, according to video footage recorded by local residents, and a poor air quality warning was issued, which extended on and off through Monday and into Tuesday. Those with breathing problems, the elderly, and children were asked to reduce prolonged or heavy exertion. The wildfire in Napa and Yolo counties, dubbed the “County Fire,” grew to 60,000 acres and was 5 percent contained as of 7:05 p.m. on July 2, according to Cal Fire. It’s the biggest fire in California so far this year. At least 1,200 firefighters are braving the heat to battle the flames, according to KTVU. “We’ll be focusing our efforts to the north and on the south side, as this has been the primary spread of the fire,” said Captain Jordan Motta of Cal Fire in a video on Twitter. The fire has sparked a number of mandatory evacuations and advisories. The National Weather Service issued several red flag warnings over the weekend for the area, which is the highest alert, due to hot and dry conditions increasing the danger of wildfires. Meanwhile, the Pawnee fire in Lake County was at 14,900 acres and 80 percent containment.